Use this gorgeous Frame guest book at your wedding as a unique alternative to the traditional guest book! 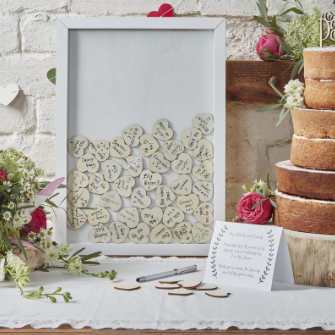 Ask your guests to write their lovely messages on the wooden heart pieces which then slot into the frame. Each pack contains 1x Frame Guest Book and 70x Wooden Hearts & 1 x instructions card. Frame measures 30cm (W) x 42cm (H) Wooden hearts measures 4cm (W) X 4cm (H) The frame is painted white wood and features a glass front.